Yesterday started Banned Books Week. It’s still hard for me to believe that today, in 2018, we’re still fighting for our right to read and for authors not to be silenced. As I was thinking about this post to kick off Banned Books Week two recent hooplas came to mind. What Do You Think About Banning Books? Do You Think Books Should Be Banned/Challenged? Are There Any Books That Should Be Banned/Challenged? The Office for Intellectual Freedom (OIF) puts out a Top Ten List every year of the most frequently challenged books and it never ceases to amaze me the reasons behind the challenges. Fun Fact: According to the OIF there may be as many 10,766 challenges every year. WTF?! 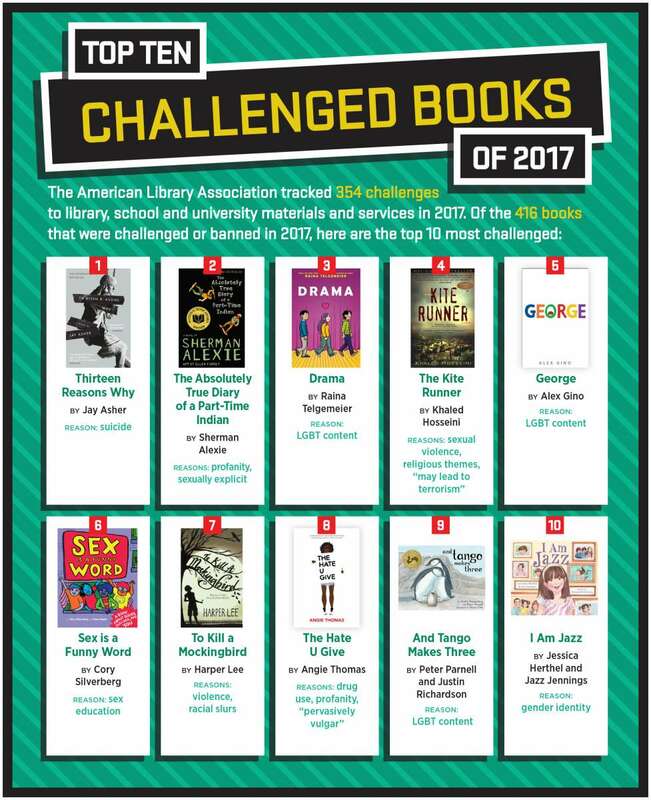 Here is an infographic from the American Library Association of The Top Ten books that were banned or challenged in 2017 and their reasons. Fun Fact: On the OIF’s 2015 Top Ten Most Frequently Challenged Books, nine contained diverse content – people of color, LGBT people and/or people with disabilities. Hmm, I wonder why? 🤔 Don’t marginalized readers deserve to see themselves represented in books too? Don’t we all deserve to see ourselves represented in books? What’s wrong with having a POC or and LGBTQ+ or disabled main character? Every year I try to read a book or two for Banned Books Week and this year I’m being pretty aggressive. I was a little surprised that the only book I’d read was The Hate U Give and The Absolutely True Diary of a Part-Time Indian. I’ve had And Tango Makes Three, The Kite Runner and To Kill a Mockingbird on my list for a few yeas. 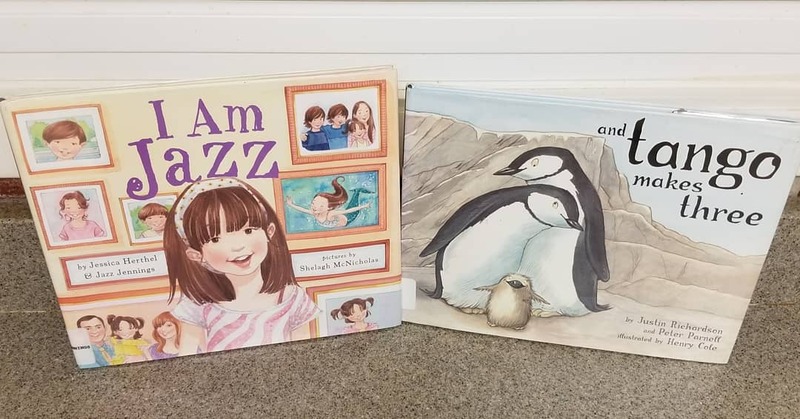 I went to the library and checked out the following picture books because I had to see what the problem is. 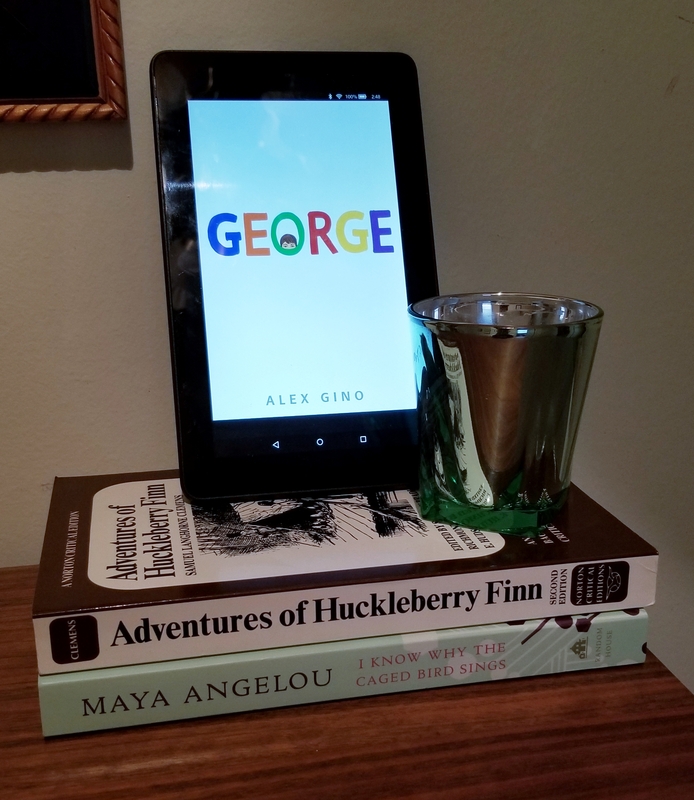 I’m also going to try and read Huck Finn and I Know Why the Caged Bird Sings which are on my list to read this year. I should be able to get it done after all I am on vacation this week and it’s going to be chilly and rainy for most of my vacation. This post is brought to you as part of the 2018 Discussion Challenge. I think it’s so sad when books are banned because of LGBT or other marginalized voices. I agree you can’t monitor everything they read and do. You just have to hope they make good choices and learn from the bad ones. I know once my mom gave me the green light on certain genres and themes, she didn’t monitor too much. I have a LOT of opinions about censoring and banning books, and have written about six different blog posts on it during the past three Banned Book Weeks. As a middle school reading teacher, I 100% believe that parents have the right to regulate what their own children read, but have no business trying to regulate what other kids read. And as a professional, I’m not going to be bringing a book in which the KKK leader explains that blacks are sub-human, as a previous commenter suggested. I have a responsibility to do some gatekeeping around what is a good fit in my classroom. I do not have a single student who would benefit from a book like that. But I do have students who would benefit from every single book on that “Most Challenged” list. Don’t even get me started on the wickedness of challenging a book just because it includes GLBQT characters, and the message that sends to GLBQT students about their right to common human respect. I also get angry about would-be-book-banners who pull words or phrases out of context instead of reading the whole work and seeing what the overall message is. I hope you enjoy all of the books you chose to read! I think And Tango Makes Three is one of the cutest picture books ever! Hm. I grew up in a super strict and conservative household. My mom actually loathed the fact that I was such a bookworm (she still does btw lol). But with all that being said, my mom never once censored my reading. Not that I was reading anything bad. Still though. She trusted my judgment. I think if she had ever told me “don’t read that”, it would have only piqued my interest. I think at some point parents have to trust that they’ve raised good kids. P.S. I Know Why the Caged Bird Sings is on my TBR! Wow! That’s interesting that you’re mom didn’t/doesn’t like that you’re a bookworm and never censored you’re reading. It’s good that she didn’t censor it. I think you’re when parents censor reading it makes you want to read it more. But that’s with adults too. You tell they can’t do something and it makes them want to. And you’re right at some point we have to trust that we’ve given our mini mes the tools to make the right decisions and trust that they will. I’m looking forward to reading I Know Why the Caged Bird Sings. It’s been on my TBR for a long time. I know. Sometimes I feel like my upbringing was one strange paradox. My music, my clothes, pretty much everything in my life was controlled by my mom. But not my books. I still find that weird. I like to think she trusted me enough to let me read what I wanted. Which is why I don’t believe in censorship. Let people read what they will. “Good”, “bad”, and in between. Omg I actually got a free copy of it from the library recently. So now it’s just staring at me. Waiting for me to read it haha. Someday. Soon! For me, I don’t want people outside of my immediate family telling me that something is inappropriate. What one person deems sexually explicit or violent or immoral may not fit into my construct and vice versa. I believe that there are some books out there that shouldn’t be in school curricula, but at the university level all bets are off. If a parent objects to a book they have every right to voice that objection to the teacher or school board, but I don’t think their objection should be forced on everyone. If a parent objects then the parent should offer a reading alternative for his/her child. I agree with you, I wouldn’t want my mythical child checking out that sort of book from the school library either; but I would also look at it a teaching opportunity – an opportunity to have a discussion with my son about why they felt that way and have him do some research on Black History to find positive African American figures that debunk that myth. Ah, if only all parents paid attention to what their children are reading, but sadly many of them have to rely on schools or libraries guiding them or they get no guidance at all, I’m afraid. I want to read I Know Why the Caged Bird Sings soon, so I look forward to hearing your thoughts on it. Enjoy your vacation time! I need to read more “banned” books. Of course I have read the classics. i agree, most of the time books are banned because of the diversity of people and ideas. You haven’t read To Kill a Mockingbird? One of the best books ever. Huck Finn is a great book too, mostly because the most important content is what you get from reading between the lines, not the actual words themselves. I always feel embarrassed admitting I have yet to read To Kill a Mockingbird. It’s been on my TBR for years. The messages in Huck Finn are definitely beneath the surface. It’s a shame folks can’t get past some words in order to get the deeper meaning.